Globally, 5 billion people do not have access to safe and affordable surgical care, resulting in nearly 17 million lives lost each year—this is more than five time the number of lives lost to HIV/AIDS, tuberculosis and malaria, combined.1 Not surprisingly, most of these people live in low- and middle-income countries, and within these countries, the poorest individuals and those living in rural areas suffer the most. The provision of safe surgical care, which includes safe anesthesia and obstetric and trauma care, is affordable and not only saves lives, but also promotes economic growth.1 For every $1 invested in strengthening local surgical systems, $10 is returned in improved health and increased productivity.1 By focusing on coverage of “bellwether procedures,” which include cesarean sections (C-sections) and laparotomies (abdominal surgery) and management of open fractures, 80% of emergency surgical needs can be met. Maternal and newborn health programs that address the need for safe surgical and anesthesia care will come much closer to achieving global goals in ending preventable maternal and newborn deaths. Surgery is an “indivisible and indispensable part of health care,”3 and surgical care that is available, accessible, affordable, timely and safe is essential for health system strengthening and achieving universal health coverage. 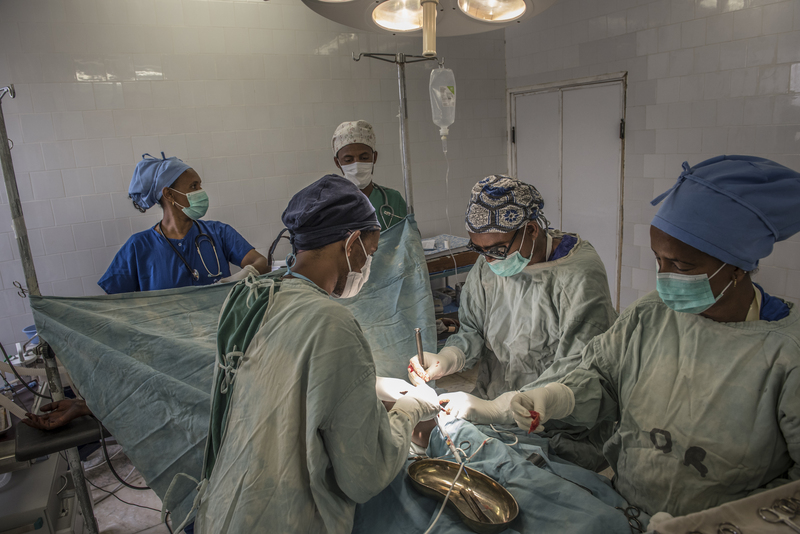 Sub-Saharan Africa has less than 1% of the number of surgeons in the U.S.
As of December 2018, Jhpiego is implementing safe surgery programs in Ethiopia, Tanzania, Kenya, Madagascar, Cambodia and Laos, with generous support from GE Foundation, ELMA Philanthropies, Medtronic Foundation, Harvard University and Sanofi Espoir Foundation. Leading policy and advocacy efforts: Jhpiego is well-positioned as a policy and advocacy leader, given our strong relationships with ministries of health and leadership in global, regional and national forums. Jhpiego’s efforts in policy and advocacy aim to drive surgical access to the top of the global health agenda. This includes advocating for the consideration of safe, affordable surgical care in current health care guidelines, licensing procedures, clinical governance, financing mechanisms and partnership development.Jhpiego is a founding member of the G4 alliance, which emphasizes the importance of prioritizing access to safe, affordable surgical care to target countries, stakeholders and technical organizations. 1. Meara JG, et al. Global surgery 2030: evidence and solutions for achieving health, welfare, and economic development. Lancet 2015; 2015; 386: 569–624. 3. Kim, JY. 2014. Opening address to the inaugural “The Lancet Commission on Global Surgery” meeting.